How do you feel about push-ups? Do they make you feel strong? Push-ups are the bane of my fitness existence. For some reason, they have become the hallmark of fitness in my mind and I want to be able to do them, in proper form, and with ease. So far, that has not happened. I used to think that I could do them but it turns out that my form was all wrong. I was actually doing push-ups in two steps, lifting my upper body and then pulling up my lower body. And let’s not even get into how my elbows were all stuck out. Those ‘push-ups’ weren’t serving me well or making me stronger. In fact, they were hurting my arm and shoulder. At one point, shortly after getting my 1st degree black belt, I had to take some time off of Taekwon-Do because I had messed up the muscle behind my shoulder blade and I was in a lot of pain. The pain wasn’t just the result of my push-up form but the push-ups definitely didn’t help. After I recovered from that injury, I vowed that I was going to learn to do push-ups properly – and from the floor. However, life has gotten thoroughly in the way, and I have not made it as much of a priority as I had intended to. That doesn’t mean that I haven’t tried, it’s mostly that I haven’t stuck with any one system long enough to get results. That’s an issue that often crops up for me – that I am so interested in making the ‘right’ choice of exercises that I end up not doing any specific set consistently. This was in May of 2016. If I had stuck with the system I was doing then, I would be a push-up EXPERT now. Sigh. Here’s what I have tried – I have done some rehab exercises to strengthen the muscles around my shoulder blades. I have done push-ups against the wall, against my counter, and on the stairs. I have done them from my knees. I have done them with my knees resting on a foam half-dome. I feel like I have done every possible variation on a push-up. Each of these things was moderately successful, I can do a fair number of wall/counter push-ups, for example, but I always have the feeling that if I were doing something *else*, it would be more effective. I don’t know what that elusive ‘something else’ might be but I often feel like I am wasting my time. I keep feeling like there is some other muscle I should strengthen first and then push-ups will come more naturally. I keep feeling that the work I do is not getting me any closer to being able to do push-ups from the floor. Yes, I can see how ridiculous that is. Or at least, I can see it now, while I’m writing. In all of the times I tried to do push-ups, all I could see was that I wasn’t able to do what I wanted to be able to do. And, that it didn’t feel like I was on the path to being able to do it. But, when it all comes down to it, I want to be able to do those push-ups from the floor. I want to be able to do them easily, with finesse. It doesn’t actually matter whether they are any sort of proper measure of fitness, I want to be able to do at least 20 of them. I know that going from where I am now to doing 20 push-ups is going to take consistent work. I will have to work hard at it. I will have to get over my (mostly subconscious) search for the shiny, perfect system that will work right away. So, here’s what I am going to do. I am committing to push-up practice starting today. At least three days a week, I am going to do a set of the shoulder rehab exercises, then I will do a set of of push-ups with my knees on the foam half-dome, and I will finish with a set against the wall. Those sets may not be equal in number but I will be consistent with it. Right now, I wouldn’t even say I can do one push-up from the floor in good form. I mean, if I *had* to, I could probably pull off doing a few, but they wouldn’t be in good form and I wouldn’t feel confident about it. I don’t know how long it will take me to get to 20 push-ups. I am hoping it will happen long before I do my next belt test (which might be in June of 2018) but I am not going to worry about a time frame. My goal is to make consistent progress, to keep getting better. 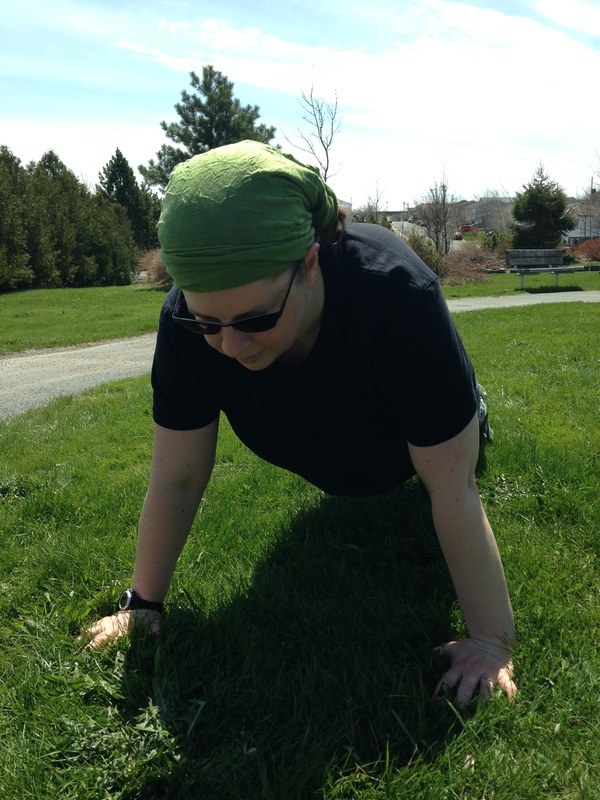 I just want to feel confident about my push-up ability – to be sure that I can do a specific number when I want to. My first phase of this project will be one month. So, when I write my post for the 16th of December, I’ll give you a push-up update. Please hold me to it! PS – Can you do push-ups easily? How many can you do? Do you have any ideas on how I can make them a bit more fun while I get used to them? Previous Post Thank you Bicycling Magazine! Just a few days ago I’ve promised myself that I’d be able to do 100 proper push-ups by November 2018. I now train three times a week as well. So keep it up, I’m excited to have a virtual training buddy! 🙂 We can do this! Sounds like you have a great plan and I am THRILLED to have a virtual training buddy. Let’s rock this! Hi Christine, I do like pushups. I can do about 20 straight – if they come at the end of a circuit workout where I have already been lifting weights with my arms, I’m done at 20. I admire your persistence. But don’t hurt yourself. I can no longer sit cross legged easily, which drives me nuts at the end of a yoga class when I’ve been able to do everything else. I had decided to just give up, and accept that this as something my body no longer wants/can do, but after your detailed plan and dedication has inspired me to rethink and try again before I throw in the towel! Thanks! You like them if they come at the *end* of a workout? Hmm, I would have thought the opposite. Is it that the previous weight-lifting warms up your muscles? It can be hard for me to strike a balance between acceptance and persistence and it is *really* hard to figure out which way to lean on any given body-issue. For me, it keeps coming back to ‘do people stop moving because they get old or do they get old because they stop moving’? That’s an overdramatic question in this case but the gist of it is the same. I didn’t explain myself very well, and left out this part: In the middle of a workout, I can do two sets of 15. I feel good, but by the end of 30, I feel it. If, though, it is a circuit workout and the push ups come after I’ve lifted weights, I’m done at 20. My shoulders let me know. Thanks for the opportunity to clarify. You’ll notice I didn’t have any tips on how to make it fun. I never think of it as fun, but I like the feeling I get after I’ve completed them. I feel the effort and I feel strong. Maybe that’s my ‘fun’? Sit on a block, or roll up the back of your mat. Most people need to elevate their hips to sit cross legged comfortably. How did you decide your form was wrong? I wasn’t making much progress and I was uncomfortable in the process, so I asked a trainer/kinesiologist friend to look at my form and offer some tips. I like them. I can do sets of 20, with the last 5 a struggle. I found it a bit easier when I learned to tighten my abs and glutes and keep my body straight so that it didn’t sag during the set. I think it helps that I have strong triceps and lats from swimming. I would suggest doing 5 with good form, and finish with a 5-second plank at the end of each push-up so that you know you have good form. I don’t have strong triceps and I probably need more focus on my abs. Thanks for that! I hadn’t thought of incorporating a short plank at the end. Thanks for that, too. For me, they’re fairly dependent on how much I’m practicing — when they were part of my workout, I was doing sets of 20 with my feet elevated, after doing other upper body things, but when I’m not doing them regularly, normal ones start feeling difficult in the 10-15 rep range. But my upper body strength has always been relatively better than my lower body strength. Five dead hang pull-ups? Check! Squat my body weight? Yeah, maybe as a 1RM if I’ve really been working on my squats. I don’t know if I ever found push-ups *fun* but I do find it satisfying having good upper body strength, so I’m usually willing to put in extra effort to improve it. I also second (third?) the advice to keep your core and glutes tight; it definitely makes push-ups easier. Thanks for reading my post and thanks for your comment! Increasing my upper body strength is an ongoing goal of mine, and push-ups are part of that goal. I have been concentrating on tightening my abs and glutes while I practice my push-ups in the last few days and it has really helped. I spent years as a gymnast and now have arthritis in my wrists. I know the few ( like eight) I can do, are so done with the wrong form in order to compensate the inability to keep my body weight over my hands. You’ve opened my mind up to reassessing a way to fix this. I’m sorry to hear about your wrists but I am glad I have opened your mind to reassessing your movements. It’s so hard to work around an injury or a pain, isn’t it? I hope you find some ease. I can do about 25 pushups as a 52 year old woman. I’ve been doing pushups since my competitive judo days decades ago so I feel Iike they come easily to me. I also have a lot of upper body strength.